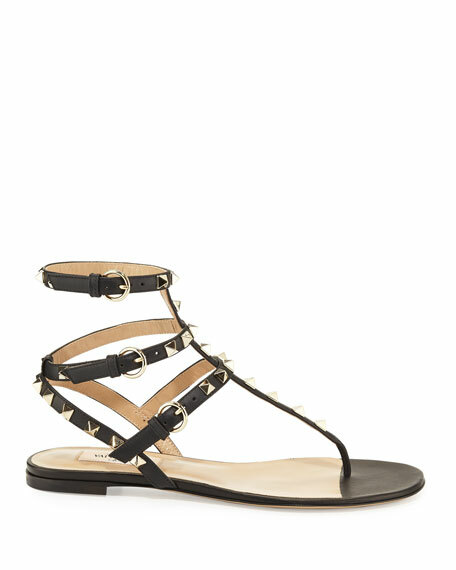 Valentino Garavani smooth leather sandal. Diane von Furstenberg multicolor fabric sandal. Flat stacked heel. Crisscross straps band open toe. Slide style. Leather lining. Smooth outsole. Diane von Furstenberg multicolor fabric sandal. Flat stacked heel. Crisscross straps band open toe. Slide style. Leather lining. Smooth outsole. "Cindi" is imported. Dries Van Noten thong sandal in natural calf hair (France) with sporty toggle detail. 0.5" flat heel. Squared open toe. Dries Van Noten thong sandal in natural calf hair (France) with sporty toggle detail. 0.5" flat heel. Squared open toe. Adjustable nylon-cord closure. Leather outsole. Made in Italy. Eileen Fisher leather espadrille sandal. Elasticized band crisscross through vamp. Flat heel. Braided jute mid sole. Round toe. d'Orsay silhouette. Eileen Fisher leather espadrille sandal. Elasticized band crisscross through vamp. Flat heel. Braided jute mid sole. Round toe. d'Orsay silhouette. Rubber sole. "Lee" is imported.